In the article Building a lean supply chain, Adam J Fein takes up the notion of building a lean supply chain and how far down along that path supply chain investments and executives really are. The article is dated Feb 2006 and so is not that far from the current state of affairs. There is a widely held, but inaccurate, perception that new technologies have led directly to declines in the inventory-to-sales ratio, an important indicator of “buffer inventory” in the supply chain. In theory, information technology-based supply chain practices such as just-in-time (JIT) inventory management, warehouse automation, and the introduction of bar codes should have allowed companies to improve their management of orders and stockpiles of materials. However, the empirical evidence for leaner supply chains is surprisingly weak. Economic research studies continue to find that aggregate manufacturing, wholesale, and retail inventory-to-sales ratios remain within historical ranges. For example, the inventory-to-sales ratio for wholesale distribution was essentially unchanged in the 1990s and has only begun trending down slightly in the past four years. In testimony to the United States Senate, Federal Reserve Bank of New York Senior Vice President Charles Steindel stated that “…the inventory-sales ratio in manufacturing has declined almost continuously since the early 1990s, which we think is consistent with improved inventory management techniques.” (Steindel 1999). Vice Chairman of the Federal Reserve Board Ferguson offered additional support by noting that “… investments in information technologies have helped firms to cut back on the volume of inventories that they hold as a precaution against glitches in their supply chain or as a hedge against unexpected increases in aggregate demand” (Ferguson 2001). Finally, at least some private companies invest in supply chain technology based on this belief. A 2003 survey found that 56 percent of supply chain management software buyers name “reducing inventory” as the most important factor fueling their investment in supply chain technology. Filardo (1995) argues the aggregate manufacturing, wholesale trade, and retail trade inventory-sales ratio have all remained within their historical ranges. Stock and Watson (2002) show that the relative volatility of inventories and sales has not changed as much as previously estimated by using more sensitive statistical tests. 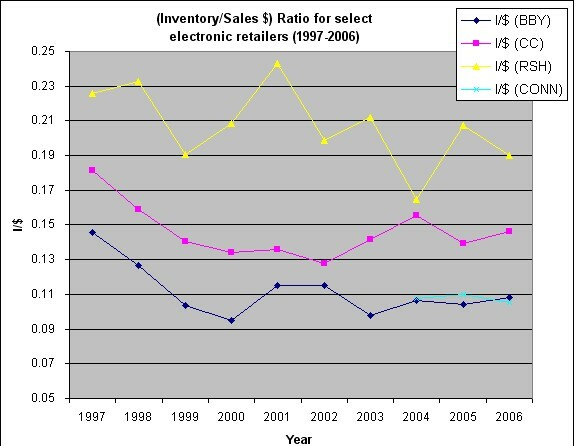 Khan (2003) questions the impact of technological innovation on the aggregate inventory-sales ratio by noting that the nominal inventory-sales ratio rose before it fell. Ginter and La Londe (2001), in one of the few studies to use financial statements from public companies instead of government data, conclude that some industries have seen substantial declines, while others have shown no improvement or shown an increase in inventory levels. You can download the excel spreadsheet here. As can be seen from the above chart, Inventory Sales ratio has been trending downwards for the selected retailers but (see in the attached spreadsheet), the inventories have been rising. What must be noted however is that these retailers typically source from companies in the US whose operations might paint a different picture. That I’ll be exploring in my extension of the above spreadsheet. To my surprise, half of the 18 major sectors within the wholesale distribution industry had no meaningful change or experienced an increase in the inventory-to-sales ratio from 1992 through 2003. Information technology may indeed have improved inventory management, but this improvement was not reflected in a key performance metric for many parts of the wholesale distribution industry. He next takes up the case of the pharmaceutical industry and how a negotiated structure of contractual relationships have changed the operations there. Until 2002, most drug makers compensated wholesalers by allowing them to purchase more products than near-term sales demand required. Since drug prices were increasing, wholesalers could earn as much as 40% of their margin by holding extra inventory and selling it when prices increased. Channel relationships were transformed only after manufacturers and distributors began signing new fee-for-service and inventory management agreements in 2003. Today, manufacturers are successfully paying U.S.wholesalers not to hold more than one month of inventory. Most arrangements offer some form of performance benefit to help distributors offset revenues they’ve lost by discontinuing inventory investment. For example, wholesalers can receive higher payments for making more accurate forecasts of prescription demand. As a result of these new business arrangements, the inventory-to-sales ratio in the wholesaler channel has declined by 50% in the past four years even as total wholesaler sales grew by one-third. Distributors have avoided adding an incremental $7.5 billion of inventory to their balance sheets. The business benefits of new relationships are being felt throughout the health care supply chain. Manufacturers can automate manual processes, better comply with new accounting regulations, and lower supply chain costs associated with unanticipated fluctuations in order patterns. Wholesalers have benefited from sharp increases in operating cash flows thanks to a reduced need for significant inventory sales investments. Innovative wholesale distribution executives should consider taking the initiative to upgrade channel management dialogues with suppliers so that both parties can reduce costs and raise productivity. Identify which of your suppliers have robust, effective lean manufacturing programs and find out if they are interested in extending their efforts to collaborate on genuine supply chain improvements. Show manufacturers that supply chain improvements can offer economic benefits to distributors, thereby offsetting the need to always offer discounts and rebates as incentives to distributors. However, there is something that I think I will find among those firms that have shifted to a global sourcing and manufacturing model – more inventory on their books and I should therefore expect that the Inventory Sales ratio should increase even with an increase in sales. As Adam Fein notes with the wholesale distribution industry, the lack of change or an actual increase in the inventory-to-sales ratio might be accounted by the outsourcing or offshoring. The business benefits of new relationships are being felt throughout the health care supply chain. Manufacturers can automate manual processes, better comply with new accounting regulations, and lower supply chain costs associated with unanticipated fluctuations in order patterns.